NEW MEMBERS: You must be a resident of Sun City Festival to join the Club. Dues are 10.00 per calendar year payable to SCF Pickleball Club, name tags an extra 6.50 and your check must be submitted with your initial application! Drop your check off at the Pickleball Club mail box in the computer room at the Sage Center! ​DO NOT USE THIS FORM FOR ANNUAL RENEWALS - Click here for renewal information. This is a combined Member Application and Name Pin Form. Do not fill out the Name Pin information if you already have a Name Pin to use on the Pickleball Courts. 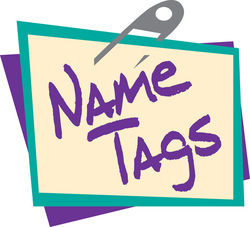 We encourage all members to wear their name tag on the courts as a courtesy to other players. If you are already a member and need a new or replacement Pin, please fill out the Pin Order Only form on the tab following this one. Please Note: Each person shall have their own issued HOA Card Number. Falsification of information in this application may lead to loss of Club membership without any refund. Please Note: You cannot share an email address with another club member. Our club software requires each member to have their own individual email address. By submitting this Application, I give permission to print my contact info in the Club Roster, which is available to all Club members. IF YOU DO NOT WANT your info in the Club Roster, please check the NO box above. PAYMENT: Dues are $10.00 per calendar year, due by the end of January of each year. Dues for New Members are payable with your initial application. Make your check payable to the "SCF PICKLEBALL CLUB". The optional Name Pin fee is an additional $6.50. Drop your check off at the Pickleball Club mail slot located in the Sage Center's computer room. ​NOTE: After submitting your application, the form will "clear" and a "Successful Submittal" message will appear near the top of the page. If submitting multiple applications, REFRESH the screen after each submittal. If desired, you can download the Application Form (in PDF format), fill in the fields using your PC, print it when completed, then turn in to the Pickleball mailbox along with your dues. Click the button below to download the Application Form.